If you’re grain-free like me (most of the time), you’ve probably gone through a period where you mourned the loss of a good slice of pizza. Thankfully, grain-free pizza crust is not especially hard to come by these days, especially in the Portland area. Unfortunately, quite a bit of it has the taste and texture of cardboard or relies too heavily on processed starches, which I try to limit. Home-baked grain-free crust recipes also abound, and many are super tasty, but I’ve never found one that produced a pie that doesn’t realistically need to be eaten with a knife and fork. Unless you’re a preternaturally orange politician or a Seinfeld character, I’d guess you probably expect to pick up your slice and eat it with your hands. Shred the zucchini in a food processor, with a julienne slicer, or a cheese grater. Disgorge the shredded zucchini (remove the excess water) by sprinkling liberally with salt. (2-3 tsp should be plenty) and set aside for 20 minutes. Now is a good time to preheat your oven to 375 degrees F (190 C). After 20 minutes, transfer the zucchini to a few layers of cheesecloth and squeeze out the excess water. You should end up with a lot of liquid and a much smaller pile of zucchini shreds. Combine zucchini mulch with the remaining ingredients in a large mixing bowl. I find that a wooden spoon works best for incorporating the ingredients into a pliable dough. Turn out the dough into a baking paper-lined baking sheet and spread into an even layer, about 1/3 inch thick. We generally use a round aerated pizza sheet that measures 15.75 inches, but a regular large cookie sheet will work well also. Pop the pizza crust in the oven for 25-35 minutes, checking at the 25-minute mark. The crust should be starting to turn a nice golden brown on top. Let crust cool before topping. After you've dressed your pie in toppings, pop it back in the oven for another 20 minutes. Let your crust cool before loading it up with sauce and toppings, and let it cool just slightly again before slicing and eating. This will help prevent the crust from becoming soggy with toppings and help your crust stay together so you achieve a good consistency for picking it up and eating by hand. 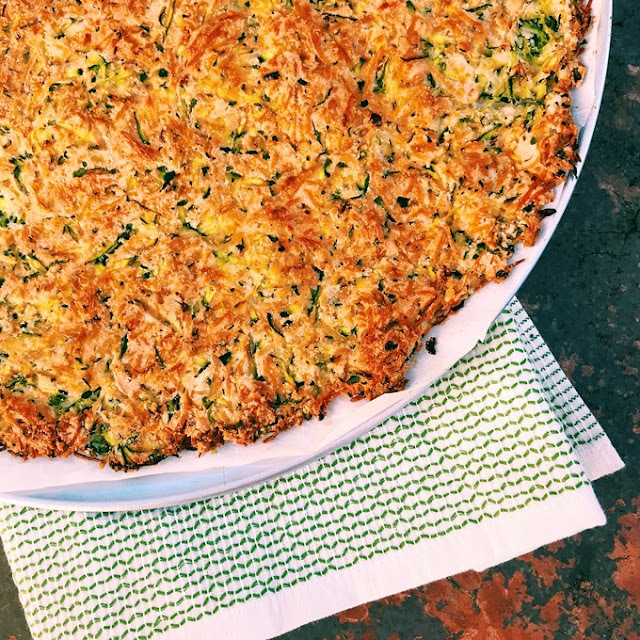 0 Response to "ZUCCHINI PIZZA CRUST"